LOOKOUT POINT HOUSE — Summer inn was originally the old cookhouse of famed Lookout shipyard, which made sturdy vessels that sailed the Seven Seas. With this quatrain, the Rev. Charles M. Sinnett prefaced the Merriman genealogy. It might apply equally well to other old Harpswell families. 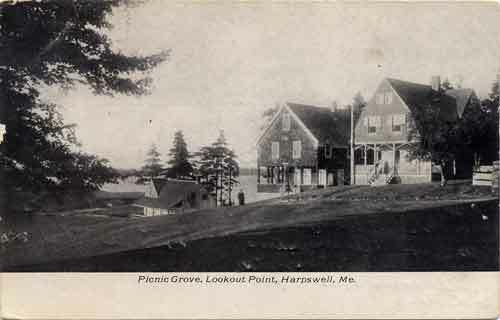 Harpswell has been called a nursery for those who sailed the seas; but there were stalwart men who stayed at home and fashioned with prideful skill the many stately schooners that carried Harpswell men to fame in those far-away places. One such shipyard thrived at the sandy point at the Lookout, although little remains as a present- day reminder. 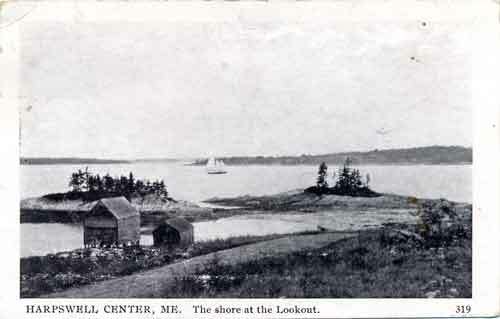 The Lookout lies on the north shore just above the old Center Harpswell steamboat landing There are three coves, named for the points of the compass toward which they face. The shipyard was in the southeast cove, which is formed by the mainland and the Lookout islands. There is one remaining symbol of the flourishing shipyard which, during the summer months at least, works as of old. That is the old bell a-top the Lookout Point House. Today the bell sounds a warning to vacationers that a for meal is just about ready. Also the bell is rung to speed the parting guest on his way. In the 1860's, however, the bell summoned the hungry shipwrights to their meals.. Yes, you have guessed it. 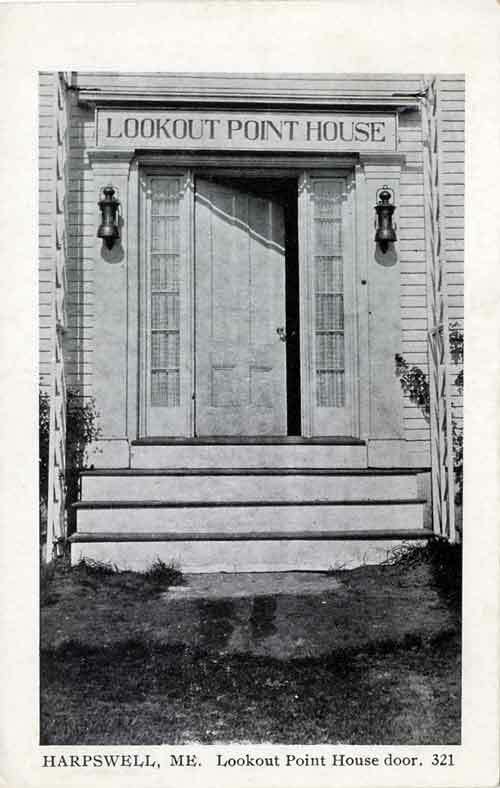 The modern, up-to-date summer hotel, with Mrs. S. L. Ransom as owner‑manager, was originally the cook house for the 'Lookout Point shipyard. The house was built by Paul and Angier Curtis, who lived on Birch Island, and the Curtis family coat-of-arms hangs in the dining room today.